This jacket offers two removable liners (a windproof shell and an insulated inner-liner), so naturally the jacket fits tighter with the liners installed. Tour Master offers a size chart for this jacket which lists an estimated chest size for each jacket size. The overall fit of the jacket with the liners installed will fit best on a person with a chest size at the lower end of the range, but with the liners removed, the jacket will accommodate a person whose chest is at the upper end of the range. My advice would be to take a chest measurement and pick the size where your chest measurement falls. For most people, this will correspond to the size they normally wear in men’s clothing. If you are between sizes, consider my comments about the liners and choose based on whether you think you’ll be using the jacket mostly with or without liners. If you plan on using the jacket mostly without the liners, then choose the smaller, but for use with the liners most of the time, then choose bigger. I found the sleeve lengths for the “regular” sizes to be average and should work well for most people. Tall sizes are approximately 2” taller in the sleeve and torso, so if you normally require tall clothing then those will be a good choice. The Intake Air 4.0 jacket is a design that starts with a full mesh shell, but then adds a “dual liner” system to give you more climate control options than a basic mesh jacket. 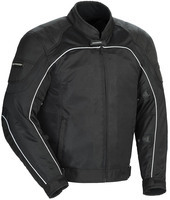 The jacket comes equipped with removable CE approved armor in the shoulders and elbows, and a removable triple-density back protector. To account for the varying fit of the jacket with the liners installed or removed, the jacket comes with a good deal of adjustment. There are adjusters at the waist, sleeves, and cuffs which you can use to fine tune the fit. There is a rear connection zipper in the jacket for attachment to Tour Master pants. The zipper also comes with the mating half that can be sewn into the pants of your choice. Be sure and take the “View Larger Images” link above to see some good close-ups of this jacket and its features.